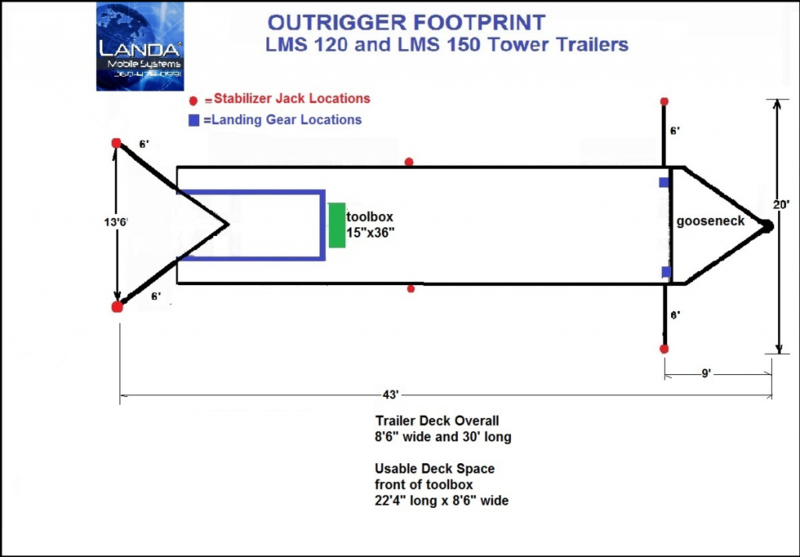 Tower on wheels (TOW) – Heartland Solutions Corp.
site-relocation needs. It has a maximum loading capacity of 900 lbs. and hide-a-key LED lighting package and reflective striping 36” Site Safe locking tool box Operation and maintenance manuals Trailer manufactured to all DOT and Canadian requirements. 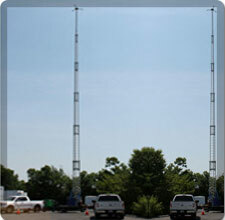 LMS TELESCOPIC LATTICE TOWER-PATENTED 150’ model (tower assembly wt. 4820lbs 120 volt a/c power operation Model non-guyed 36” super heavy duty base section All sections are schedule 40 thickness 6 ea-31’ sections, and includes 3 sector antenna mount Galvanized finish for all weather operation Limit switches for tilt and extension operation, weatherproof Weatherproof (locking) control panel 1 hp electric motor w/worm drive with optional emergency key operation Cable storage reel mounted on trailer Cable guide rings Custom LMS hydraulic system with 2ea 10,000lb rams for standing tower, 1hp 120vac motor Galvanized aircraft quality EHS hydraulically pressed ends, lifting cables (3/8") GAC 7-19 PATENTED Derlin Mast Guide Blocks 750lb payload, 40 square foot of sail, 90 mph wind, no ice 9 position ¼” GAC guy wire kit. W/ ¼” redundant tower retraction cables GAC 7-19 Tower built to all current welding standards and practices Emergency lowering key system for when there is no power. mfisher@heartlandsolutions.us or by phone at: 317-455-1158.